As deportations and state violence heat up, struggles collide. Last spring, The Nation launched its biweekly student movement dispatch. As part of the StudentNation blog, each dispatch hosts first-person updates on student and youth organizing. For recent dispatches, check out July 14 and July 25. For an archive of earlier editions, see the New Year’s dispatch. Contact studentmovement@thenation.com with tips. Edited by James Cersonsky (@cersonsky). On August 2, more than 2,000 people marched on Washington, DC, to pressure President Obama to stop deportations and expand deferred action for all. The mobilization, organized by the National Day Laborer Organizing Network, was led by undocumented individuals and families affected by the president’s policy on deportations. Day laborers, members of the LGBTQ community and children were among the speakers at the march—illustrating how deportations impact many communities. Starting at the National Mall, we took over the streets en route to Border Patrol, where we stopped briefly to hear from families affected by the crisis at the border. From there, we continued to Freedom Plaza, where we dropped banners reading “Not1More Deportation” and “DACA4All.” Our last stop was at the White House, where we announced ongoing local action to pressure the president. 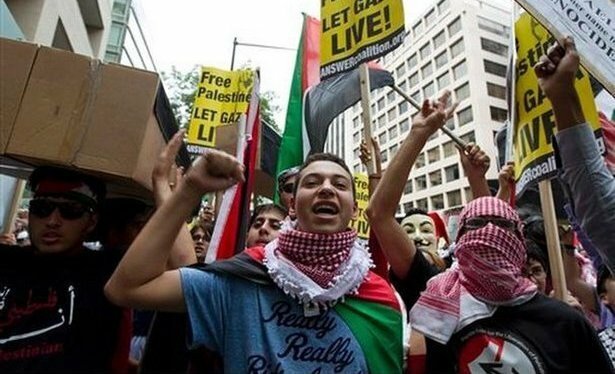 On August 2, some 20,000 people marched from the White House to The Washington Post in a display of anger over Israel’s most recent onslaught against the Palestinians. Before the march, supporters rallied in Lafayette Square to listen to a variety of speakers, ranging from Cornel West to local student activists. As a sea of Palestinian flags flooded the streets, traffic came to a halt. Once the march reached the Post, activists began to stack coffins against the windows. The protest was more than a cathartic experience; it was an opportunity for activists of all ages to reunite or meet for the first time—and share ideas for future action, including ramping up BDS work across the country. On Monday, July 28, undocumented leaders from the California Immigrant Youth Justice Alliance, Undocumented Illinois, Familia: Trans Queer Liberation Movement, ASPIRE and the National Day Laborer Organizing Network launched #MyOwnAdvocate, a campaign demanding that DC-based immigration advocates step aside and make space for undocumented people to negotiate the Obama administration’s pending changes to immigration policy. Together, we visited the National Immigration Forum, the Center for American Progress and the Leadership Conference on Civil Rights, asking all three to boycott all further immigration meetings with Obama until the people directly affected by his current and pending policies are present at the table. Afterward, we started a picket line in front of the White House and publicized our call. This week, the University of Illinois at Urbana-Champaign revoked associate professor Steven Salaita’s appointment to its American Indian Studies program. Salaita, who left his position as an associate professor at Virginia Tech, was set to join UIUC this month—until his hiring was overturned by Chancellor Phyllis Wise following Twitter posts critiquing Israel’s brutal assault on Gaza. Wise’s decision blatantly disregards academic freedom and freedom of speech—which she herself defended earlier this year amid the American Studies Association’s decision to endorse an academic boycott of Israel. Student and activist groups, including Students for Justice in Palestine and Jewish Voice for Peace have mobilized online, with petitions demanding the Salaita’s reinstatement as well as an email campaign directed at Chancellor Wise. Joining faculty from across the country, the Director of American Indian Studies, Professor Robert Warrior, has stated his support. The elected officers of UAW 2865, the union of 13,000 University of California student-workers including teaching assistants and tutors, published an open letter in solidarity with Palestinian labor unions’ call for Boycott, Divestment and Sanctions against Israeli occupation. The letter, voted on and passed by the union’s 83-member Joint Council, outlines the union’s intent to support its Palestinian counterparts and seek a membership vote once the fall term is in session. If this vote passes, UAW 2865 would become the first US union to join BDS. The Joint Council is asking members to consider divestment of UAW International’s pension investments from companies that profit off Israeli occupation; join five of nine UC campus governments in pressuring the UC to divest; and observe a member boycott of academic activities officially sponsored or funded by Israeli universities justifying apartheid. The letter calls for members to vote “yes” on the resolution. Jewish members also published a letter in support of the move. In the fall of 2013, Peer Mentors at the University of Massachusetts–Amherst began efforts to join UAW Local 2322, which represents resident assistants and graduate student workers. Peer Mentors are live-in undergraduate student-workers who assist first year students in their transition to the university, with a focus on academics. A majority of Peer Mentors have signed union cards; we believe that we deserve higher compensation and a greater voice in the nature and future of our position—which has been undergoing ongoing revisions with little or no student worker input. While the university affirms the importance of Peer Mentors, it has contested our unionization efforts to the Department of Labor and, in a hearing, stated its intention to convert our job from an hourly waged position to a for-credit practicum with a stipend. By fighting undergraduate worker unionization efforts, the university silences our voices and experiences—and damages the communities it aims to create. On the week of July 28, bipartisan coalitions of Senators and Congresspeople introduced two bills to end sexual violence on college campuses. Know Your IX’s ED ACT NOW campaign, which advocates for better federal enforcement of Title IX, was particularly encouraged to see two provisions we’ve called for since our launch: greater transparency into civil rights investigations of schools and fining authority for the Department of Education if a school violates these rights. Currently, the only sanction ED can levy against a noncompliant school is revoking all federal funding, which would be a disaster for students, particularly those on financial aid. Perhaps for this reason, no school has ever been sanctioned for sexual assault-related Title IX violations, rendering the law an empty promise. Know Your IX looks forward to working with the bipartisan coalition and student allies across the country to make sure these key provisions become law, bringing our campuses one step closer to safety and justice for students of all genders. Since last spring, federal complaints filed by scores of students across California, from the University of Southern California to Occidental College to UC-Berkeley, have pressured lawmakers to make campuses safer. Now, California lawmakers are springing into action with SB 967, a bill that would require students to have affirmative consent from their partners before engaging in sexual activity. The bill, which students have been vital in putting at the forefront of California’s legislative agenda, also aims to increase important preventative education and outreach to students to confront the widespread culture of campus sexual assault. Beyond serving as a model for how states can respond to sexual violence on campus, the bill has generated an important dialogue among anti-sexual violence activists, students and the mainstream media about how our culture can encourage safety, respect and consent. 9. Where Has Corbett Been This Whole Time? At 9 AM on Wednesday, August 6, students from Youth United for Change protested in front of Governor Corbett’s office in Philadelphia as he held a press conference on funding for education. We tried to get inside, but security refused, saying that the event was closed to the public. As Corbett came out of the elevator, we greeted him with chants—and he ran from us. We were escorted out of the building, where we rallied with students from Philadelphia Student Union. Reporters asked me if we should cut Governor Corbett some slack, because he was giving us $265 million for education—but he doesn’t deserve to be the hero status as he is the main reason we are in this struggle in the first place. We will continue to demand full and fair funding so we can have the education that we deserve. 10. When Will the Genocide End? On Saturday, August 2, more than 150 people, mostly under the age of 25, came together to offer and hear public testimony about Chicago police violence, participate in a workshop on the history of police violence and current resistance and network with each other. The gathering was the first event of a new group, We Charge Genocide, a grassroots, intergenerational effort to center the voices and experiences of the young people most targeted by police violence in Chicago. Our next action will be a copwatch training on August 21.